like you a lot in a tv series thank you,but i hate your guts(that’s your role).hope to finish watching it and to see yuo more on the other show.you think you can email me back.i’m one of your fans now,out of korea.thanks…..
dang you sure is a hottie in them movies that chu is in..
you’re an amazing actor. you made me dislike you and love you all at once in thank you. wish you luck in your future series and movies. he’s so great in Three Dads & One Mom.. awesome! hey i like him when he plays rolls in one mom three dads..he was so funny man and mess but he makes me laugh always..he’s so awesome acting as kyoung tae..
hi shin!! im one of your diehard fans!! im a filipina i saw you on screen in 3 dads & one mommy!! everytime i saw you you make me happy!!! so keep up your one of my ultimate crush in the world!!! i wish you more projects to come and it will published here in the philippines!! hi, my family and relatives enjoy watching 3 dads and 1 mom tv series. funny and absolutely one of the most entertaining comedy and love story ever made in korean movie industry. i bought a cd that incorporates the whole story and i watched it for 3 days… my days are complete and satisfied, you make laugh guys and cried out loud watching seriously with some of those sensitive and emotional scenes, huhuhu…. i should hide my tears from my cousin, hehehe… invite me guys on your website, email me pls. ronald_magbanua@yahoo.com… awaiting of your next movies, you guys are cool and hot!!! God Bless You. I’m a fan of 3 dads w/ 1mom tv series. hi there shin sung rok or ariel from the tv series “three dads and one mom” , i really like your acting. you areso natural. how i wish i can see you and meet you in person. i am really a big fan of yours. by tHE way advance happy birthday! my cousin and i really love watching “three dads and one mommy”, the cast are exemplary in there respective roles. the producer, director and staff are really great in making the tv series interesting to the viewers. how i wish you can visit our country here in the philippines for promotion of other korean movies and tv series. best regards to all the cast and staff. wish you all the best in your advocacies. by the way i really love your smile. keep the good work and take care always. or should i say mr. shin sung rok.. I love the way you act. your smile and everything..
I’m a big fan of yours..
hope that you’ll be able to read this and I’m looking forward to meet you!!!!! i like your character in 3 dads and 1 mommy,. hi!!mr. 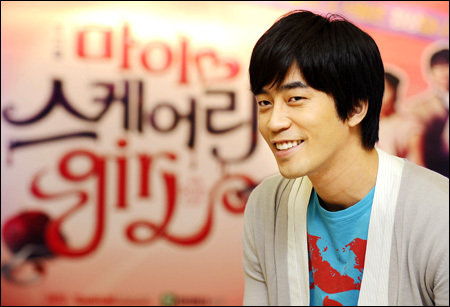 shin sung rok…for me you are the best actor, ever!! i hope you’ll understand it..hehe..goodluck to your next project!! i love your role in three dads with one mom.. you are so funny..take care always..
i wish that there will be a part 2 in three dads w/ one mommy..
take care!! and God bless!!! hi daddy.,.,remember me in 3 dads im ur daughter.,.,. Three Dad With One Mommy…. hi dear you are very niceman . you wase very handsome in thank you. if it is possible send me message. I hope meet u someday…..
Yr acting in “My Life’s Golden Age” is so manly… you hv own style when acting though watch 1 mom 3 dads but the latest one is the best I hv seen. U and Lee So Yeon make a pair!! Yr voice is marvellous where to download yr songs? also who sang the Sarang Myr is so nice!! U r very niceman in 3 dads 1 mom. I really like Hwang Kyung Tae!!! i like oyur performance and deeds in we got married! its touching my heart and i think i had fall in love with you! thank you , sung rok oppa! i wish u can find your true love finally, except shin young! Thank God for you i believe you’re a heaven sent. I really, really like you though we’re of different age i dont care. I think i finally found my man and how i wish i’m a Korean and vice versa youre a Filipino so we could meet and i was waiting all my life for you. hihihi. You are really my lucky star. I have wish to a shooting star for both of us. Just wait and see. I’m so crazy for you. I wish God will watch over you always. shin seong ruk your a great actor.if ilove you in ThankYou the more l love u in three dads and mom . ur amazing u always make. me laugh to death hahahahaha. keep repeating watching it over and over again.keep it up more tv series for you. you deserve a best acting award. more power.sarang-hae. Following my monitoring, billions of persons all over the world get the http://lowest-rate-loans.com at various creditors. So, there is a good possibility to find a college loan in every country. Dear Admin: just following up on the links for his photos when u get a chance please post them, thanks a milln! For your information, you can request any pic that you like but we will only upload the pics that we like. Sorry for any inconvenience caused. sorry for late reply Admin: ok i u/stand but what happened to the rest of his photo gallery? there’s only one intro photo now? thanks, for your info & i always appreciate all you do! To Admin: am i understanding it that none of those links i sent few days ago are to your liking? if so can you post some photos to his gallery that you think is possible please? right now you only got one up there and all the photos before that you posted were taken off? For your information, you can request anything that you like in this board but we may not fulfill what your request. praise great and i cant wait watch the new drama.. Your act is good.but now i hate u coz your new drama.i hope all muslim will never se your drama again.amin.